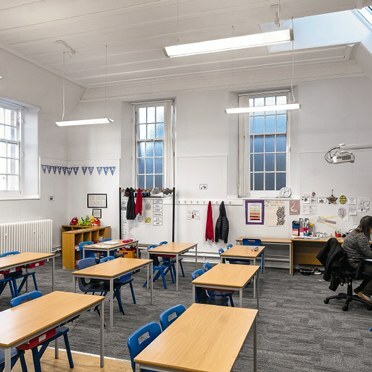 Broughton Primary School in Edinburgh dates from the Edwardian period, but has been extensively rebuilt and refurbished over the years. Thorn’s brief for lighting the school was to contribute to a finished effect that provided the perfect environment for pupils and staff. 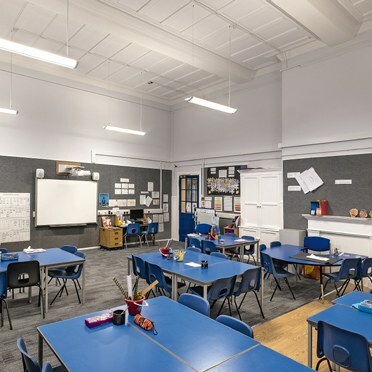 Thorn Lighting provided a low-maintenance, energy-efficient solution for the whole school. Five different types of luminaire were used, including the innovative IQ Wave with built-in wireless technology. Thorn’s IQ Wave Suspended was chosen for the classrooms. This elegant and innovative fitting achieves the ideal light distribution - with high cylindrical illuminance to light faces - with the help of a special reflector. IQ Wave achieves a unified glare rating of <19, in line with the EN 12464 standard on workplace lighting. The luminaires also feature Thorn’s BasicDim Wireless functionality, allowing them to communicate wirelessly with sensors for presence detection and daylight-linked dimming. The wireless-ready luminaires are installed like any other, with no need for additional hardware or rewiring. BasicDim Wireless also allows luminaires to be controlled by a mobile app or from wireless switches, if required. The extremely robust HiPak Pro LED has been used to light the school’s gym hall. HiPak Pro uses dedicated optics for precise light control, while also providing energy savings of up to 45% compared to traditional HID fittings. The IP66-rated Aquaforce Pro has been installed in the store rooms. This luminaire is built to resist ambient temperatures from -20°C to 35°C, and its clever drip-edge design avoids dust gathering on the light output surface, so that dirt doesn’t harm performance. The high-performance Glacier pendant luminaire provides illumination in the central atrium and entrance hallway, to provide an excellent quality of light from an attractive fitting. The precision-designed Piazza LED bulkhead has been installed around the school perimeter to provide light for security and wayfinding. Piazza LED offers optimal light distribution with a minimal upward light ratio of less than 2.5%. The new lighting creates a perfect learning environment for pupils and teachers alike. And the ability to dim lights when there is sufficient daylight means savings of up to 75% can be made on energy. In particular, the IQ Wave fittings support comfort and alertness in the school’s classrooms, ensuring the perfect lighting for desk-based tasks, group presentations or discussions, and a pleasant overall atmosphere.